Yes yes, I get it. Smartphones have put good cameras in the pockets and purses of everybody. Anyone can quickly record awesome moments and document injustices, and we can easily share them with our beloved friends and family as well as the general public. It's wonderful and revolutionary and blah blah blah. But then you're on vacation. You're admiring the horizon on the edge of the ocean, cherishing the rolling, blue-green waves crashing on the soft beach sand. The gentle, hypnotic sound of the sea allowing you to forget about the stress of bills and work and drama. Then you feel the itch, you think of someone who would find this cool. You pull out your phone, you line up your shot, and share it. You return to your moment, but it's not the same. You've lost that feeling. 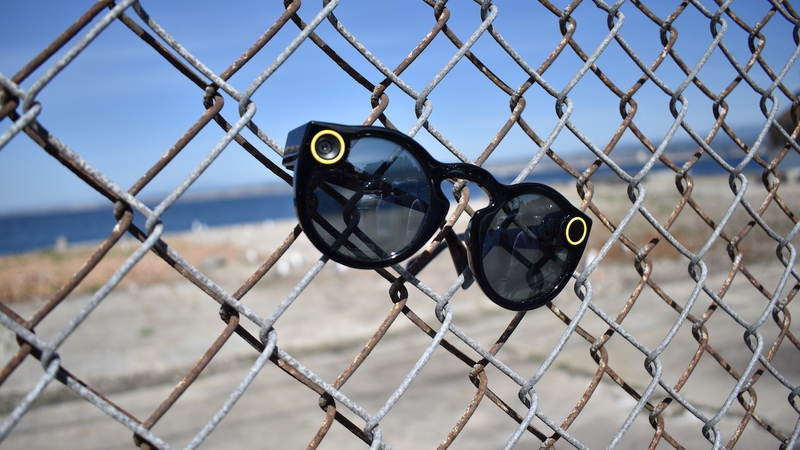 There is a solution - wearable cameras - and the one wearable camera that's most perfectly suited to a vacation or excursion right now is Snap's Spectacles. I mean, it is just a pair of sunglasses with a camera built in. So on a weekend trip to Monterey, CA I decided to challenge myself. I would only use Spectacles to record my experience. No smartphone camera. No DSLR. No nothing else. Just Spectacles. I arrived in Monterey just after sunset, my tummy was rumbling and I was ready to dive into the fresh seafood the city is famous for. I made my way down to the tourist destination that is Fisherman's Wharf and chose Old Fisherman's Grotto. During the day at Old Fisherman's Grotto, there are beautiful views of the ocean through large glass windows that let in fresh daylight to brighten up the interior, making it a great place to take photos and video. Even more so when you get their fancy plates, like my halibut, which is crusted with macadamia nuts and comes with colorful veggies and a dark maple sauce on the plate. Perfect for a picture. But it was night time. There was no beautiful view of the ocean. There was no fresh daylight. There was only dim romantic candlelight. And then my fish came and it truly was perfect for a picture. If only I had brought my Spectacles. It turns out making your wearable camera a pair of sunglasses limits its use. It's hard enough to pull off wearing sunglasses at night, or in dim, dark places, it's even more difficult when you have something like Spectacles on your face. I had left them back in my hotel room, and didn't see the need to take them out in the dark of night. So, you see the problem here. Every once in a while there's a tech product that the general population will latch onto. If you have it on your persons, people notice and will ask you about it. Unfortunately and fortunately, Spectacles is one of those things. Putting Spectacles on is like becoming a beacon, especially in a crowded tourist attraction like Monterey's Cannery Row. You can practically feel people's necks craning to see the Spectacles as they walk by. You can hear the mumbled "are those the Snapchat glasses?" as you tip toe around a crowded line for some free chocolate samples. It's pretty surprising people still pay attention to them, as Spectacles have been out for about five months now and many people consider them a fad. On one hand, it's clear enough people recognize and are comfortable enough around Spectacles that recording things is simple and without trouble. This is pretty much the opposite of what happened with Google Glass, which had people so concerned about privacy that it was banned from several restaurants. I was able to snap away without anyone getting freaked out that I might be imposing on their privacy, and at times it felt even more comfortable than walking around and taking photos with a DSLR or iPhone. On the other hand, every once in a while there's that person who's curious enough and comfortable enough to ask about them. "Are those Spectacles?" Yes, you answer. "How are they?" Pretty cool so far, just trying them out, you respond. "Oh cool, can I try them?" Sure, you relent. And on and on the cycle goes. Sometimes, it became so much that I just had to put on a regular old pair of sunglasses for a bit. One of the beauties of wearables is that they're more likely to blend into the background and allow you to concentrate on what you need to get done. This is definitely the case with Spectacles. Because initiating a video is simply pressing a button on the frame, there's almost zero friction to recording. Compare this with a phone. First, you have to pull your phone out of your pocket or purse. Then you have to open the camera app. Then, if you want to capture a video, you need to change to video mode. By then, the moment could be gone, forever relegated to your fickle memory, like my beautiful halibut (sorry, buddy). My family and I were at a pizza place, and we discovered there was a cute little kitsch pizza clay oven play set for kids. That way, they can pretend to make pizza as their pizza was actually being made. My mother spotted the set and asked my brother to make her a pizza. He obliged. It was one of those dynamic family moments that happen in new places, and I would have missed the entire thing had I relied on my phone. But I got it all, and I got it all because of how little friction there is in using this type of wearable tech. Later on, we visited a couple old and creaky historic houses in Monterey that have since been converted into museums. I'm big on museums, I tend to read every single piece of information and look at everything. I'm also big on taking photos of cool exhibits for later, but the problem is that I have to first look at the exhibit, take it in, and then pull out my phone and take a photo. It's double the work and time. Not so much now. I click the little button, I look around as I normally would and don't even have to think about taking a photo. I can just focus on the exhibit. That, more than anything else, is the magic of Spectacles. I didn't have to worry about documenting anything, I didn't have to worry about lining up shots or making sure I took a good picture. I just pressed a button while I was enjoying my day. Even though I wasn't disconnected, it felt like I was. When Snap CEO Evan Spiegel announced Spectacles, he talked about how watching video from them is like reliving a memory. While watching first-person video is cool, I'm not sure I buy that after seeing my footage back. It's neat, but without the immersive nature of something like VR it's hard to re-live a memory via Spectacles. However, I have never had as many people message me telling me that it felt like they were right there with me in Monterey. I'm already dreading having to pull myself out of moments to record them in the future. I want to be able to be present in a moment, but I also want to be able to record it to share with friends in the future. Spectacles, right now, is the best at that. And it's not only good for capturing family moments or stuff like museums. Gabe Shakour, a YouTuber and Spectacles user, told me he enjoyed taking his Spectacles to Disneyland to film stuff like thrill rides. On something like Splash Mountain, which takes a deep dive that makes it hard to clutch onto cameras or phones, it becomes far easier and less stressful to record something. Then there's Spectacles' circular video, which is strange and weird and something I wasn't fully behind. Shakour, however, argues that circular video is actually better built for the smartphone era. "If you record something vertical and watch it horizontal there's a problem," he said. With circular video, you can watch it both ways. No one loses. The recorder doesn't have to worry about flipping their phone and the watcher doesn't boil their blood watching vertical video in a horizontal format. Circular video, however, isn't supported outside of the Snapchat app. Anywhere else, it's just a circle with a white border around it. It's ugly and something Snap definitely needs to work on, maybe with some kind of neat-o public API. And then there's capturing those moments you meet someone famous. Rachel Tobac, a senior community manager at Course Hero, told me how she used it to record her interaction with a cast member of the San Francisco iteration of Broadway smash hit Hamilton. She wanted to capture the moment, but she didn't want to hold up her phone because she felt it was "really obnoxious." So she used Spectacles, and she was able to have a natural, free-flowing conversation with the star of the show. Spectacles even became a talking point for both of them. Spectacles are far from perfect. They can't take still images and it can get time consuming transferring snaps from the Specs section of the Snapchat app to your actual story. Plus, there is no support for its circular video outside of Snapchat, making it a very limited ecosystem. But when they work, they are easily the best wearable you can take on vacation. You can fully concentrate on relaxing, or engaging, or living in the random moments of life rather than experiencing everything through a 5-inch screen.